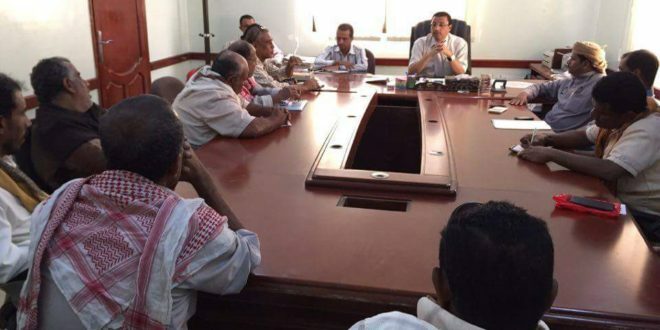 The General Director of Mukalla Dr. / Abdalbagi Alhuthrey held a meeting on Monday in the city of Mukalla with the public transportation buses concerned. Where the meeting discussed ways to address some of the problems of the Directorate such as randomness in determining transporting fare, traffic jam and rush hour because of stopping bus recurrence. Dr. / Abdalbagi Alhuthrey stressed on the importance of concerted efforts of everyone for the orderly and civilized work. 1. unify the price of the transfer of large and small buses in Mukalla. 2. Getting the public transport to the areas that not reached by buses and to work on delivering people there. 3. Identifying specific positions to bus-stops to avoid accidents. 4. Checking out buses every six months. 5. Estimating public transport vehicles. 6. preventing any issuance of illegal plates for vehicles. 7. Activating the delegates of the union in the streets to adjust in conflict with the rules and regulations of the association in the directorate and to take necessary legal procedures against them. 8. There must be a connecting loop to link the combined associations and centers to adjust the workflow and solve difficulties and obstacles, if any. – the Director of Land Transport Authority in the Mukalla, Omar Bin Break. – The Director of the Directorate Security, Jamal Bin Aoun. – The Director of the Public Works in Mukalla, Adel Alghreeb.